An extremely simple definition of flooding is “too much water in a new place” but a more technical description is when water has overflown into an area that is normally dry. In Alberta there exists a potential for flooding along all rivers and streams and there is also potential for flooding from rising groundwater levels or an abundance of stormwater. When floods occur there is the potential for property damage, hardship to people, and loss of life. However, flooding is also a natural hydrological process required by some plants and animals to thrive. There are three types of flooding of which have the potential to impact Albertans. They are Fluvial Flooding, Pluvial Flooding, and Groundwater Flooding. Fluvial flooding occurs when surface runoff washes into a river causing the water to breach the river’s banks. The water then overflows into the surrounding area. Ground conditions, such as amount of soil moisture, seasonal variations in vegetation, depth of snow cover, imperviousness due to urbanization. Flash Flooding – Rapid flooding caused by combination of intense rainfall and fast runoff. Flash flooding generally occurs in less than 6 hours and is therefore difficult to predict. Ice Jam Flooding – When an ice jam forms on the river, the flow of water behind it backs up until the jam breaks, causing a rush of water downstream. Alluvial Flooding – Alluvial fans are naturally occurring deposits of unconsolidated sediment that have accumulated at the mouth of a mountain canyon. As sediment comes downstream it accumulates until the riverbed rises high enough that water spills over the banks and begins to create a new path for the river in a lower area. The process is then repeated in a new area. This process causes the alluvial fan river to move either gradually over time or rapidly during flash flooding  . Dam Break Floods – Improper care of dams or the accumulation of water that is higher than the maximum holding threshold can contribute to a dam break. A dam break will cause overflowing of the river downstream due to the suddenly released volume of water. This is also called catastrophic flooding. Pluvial flooding is when rainfall or snowmelt is not absorbed into the ground forcing the water to flow overland. The area will remain flooded until water has drained away through stormwater systems or waterways. In instances where there is no drainage system, such as the prairie pothole region, the water ponds remain until the excess water evaporates, sublimates or transpires. Lot level actions by property owners. 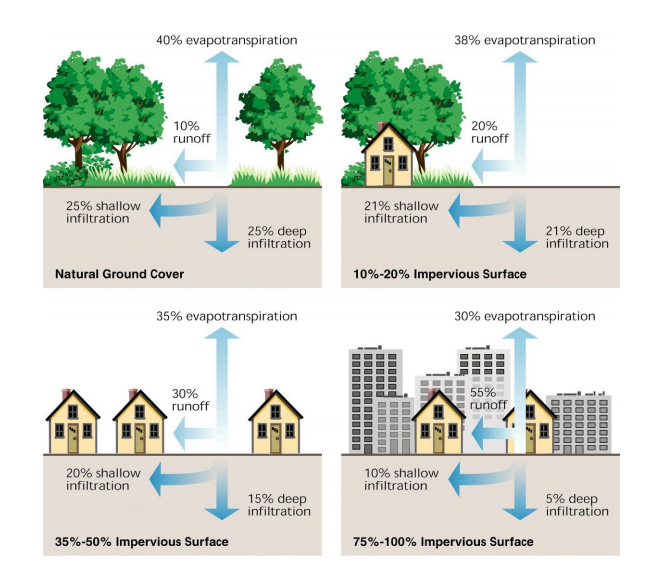 Figure 1 – Imperviousness due to urbanization’s effect on flooding. The predominate subtype of pluvial flooding is stormwater flooding, which is sometimes called urban flooding. Although urban areas may be flooded when riverine flooding occurs, urban flooding is often used to refer to pluvial flooding in urban areas. Urban flooding occurs when the runoff from a heavy downpour of rain overwhelms the drainage system. The excess water cannot be absorbed by the ground or contained within drainage systems. This results in water flowing overland into nearby lakes and streams or creating temporary pools in low(er) lying areas. Groundwater flooding occurs when the water table rises up through permeable sediments to the ground surface or basements. Groundwater flooding can occur weeks or months after a large rain event, and may not be linked to any specific rainfall event. Shook, Kevin. "A new tool for modelling Prairie flooding." University of Calgary. Hotel Alma, Calgary, AB. February 18th. Flood Forecasting Methods and Models Workshop. How Are Flood Maps Created In Alberta? What is a 1-100 Year Flood?